Dining on a Royal Caribbean cruise is a favorite activity, because Royal Caribbean put so much into its dining options. There is plenty of great cuisine to enjoy on every Royal Caribbean cruise, and we have four great tips for getting a little bit more out of your dining experience onboard. These tips are designed to give you the knowledge ahead of time to be properly prepared for your cruise, rather than perhaps running across one or more of these tips in the course of your vacation. Each evening in the main dining room, there is a printed menu that guests can order from, but there are many more options you can consider beyond what is written on the menu. The main dining room dinner menu is designed to appeal to a great majority of guests, but perhaps you have a dietary restriction, or you just really want something else. Guests can ask to speak to the head waiter at any point and order something special, provided the chef in the galley has the ingredients to make it. The example I often share is Royal Caribbean used to offer Indian dishes on its old main dining room dinner menus, but the current version does not offer it. As a result, I always speak to the head waiter and ask to have an Indian dish prepared for me each evening. Sure enough, my waiter brings me that special dish every night. Royal Caribbean's Ultimate and Royal Replenish drink packages include premium coffee and tea, and on select Royal Caribbean hips that includes Starbucks beverages. On non-Oasis class cruise ships, Starbucks beverages are brewed at Cafe Promenade or Cafe Latte-tudes locations, which gives guests with these beverage packages the ability to order drinks from the Starbucks menu. Keep in mind, Royal Caribbean ships that have a free-standing Starbucks location (Harmony of the Seas, Oasis of the Seas and Allure of the Seas) do not allow for use of beverage packages to order Starbucks. Royal Caribbean's specialty restaurants are incredibly popular, but an under-advertised special offer is some specialty restaurants will offer a discount for guests who dine there on the first night of the cruise. There is something about the first night of the cruise, where it seems to be the least desirable evening to eat at a specialty restaurant. Perhaps guests prefer to explore or dine in the main dining room on day one, but for whatever the reason many specialty restaurants offer a first night discount. Unfortunately, you will not be able to reserve a time at a specialty restaurant in advance of your cruise for this discount. 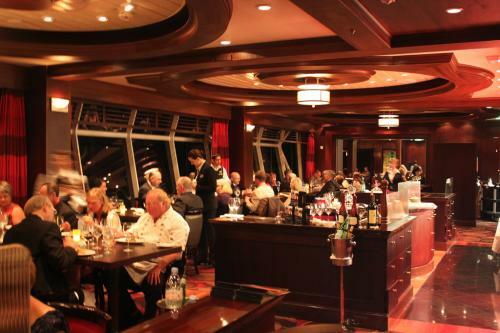 Most of the time, you just go to the restaurant on embarkation day and inquire about the availability of the discount. This tip is something I learned from someone on Periscope, and it is sheer genius for someone that loves ice cream. On all Royal Caribbean ships, there is complimentary soft-serve ice cream on the ship. Usually, it is near the pools and there are ice cream cones available to pour the ice cream onto. Ice cream cones are great and all, but you really cannot load them up too much without an incredibly elevated risk of it falling over and you becoming that guy. For those that want to load up on ice cream without multiple trips to the machine, grab a drink cup from somewhere onboard. Usually, the water cups in the Windjammer are perfect for this. Take the cup and fill up the cup with as much ice cream as you can handle. The result is that ice cream fix you have always dreamed of! Do you have any Royal Caribbean food hacks to share? Post in the comments below the tips and tricks you have learned over the years!